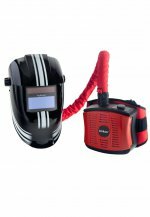 The combination of the Navitek* helmet with the Airkos* filtration unit offers the perfect mix for welding and grinding applications, with a TH2PRSL classification for respiratory protection. The full clear visor of the Navitek* provides an extra-large viewing area for grinding and prep-works, while keeping the Airkos* protection active. 4 Navitek* versions are available: S4 and S9 for autodarkening filters, and M5 and M11 with passive mineral glasses. All versions of the Navitek* Airkos* are available with or without side vision, manufactured with shade DIN 5 polycarbonate. The Kapio* helmet associated to the Airkos* filtration unit provides the right combination for welding applications, with a TH2PRSL classification for respiratory protection. The Kapio* can be available with the S4 or the S9 autodarkening filter. All graphic designs of the Kapio* can be selected and combined to the Airkos* Powered Air Purifying respirator (PAPR). All versions of the Kapio* Airkos* are available with or without side vision, manufactured with shade DIN 5 polycarbonate. The Navitek* DIN 5 Visor is the association of a large and liftable DIN 5 full visor to the clear grinding visor below. 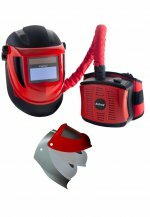 This dual visor is the perfect solution for torch-cutting, plasma-cutting and brasing applications, as well as grinding. Combined with the Airkos*, this helmet provides respiratory protection with its Lihtium-ion battery and its steady airflow. Based on the light but robust Navitek shell*, the Navitek* Visor provides an extra-large viewing area. This visor is made out of clear polycarbonate, with a 1mm thickness, fully EN 166 B certified and therefore for grinding. Once associated to the Airkos* filtering and powered-air unit, the Navitek* Clear Visor offers a TH2PRSL classification for respiratory protection.